Formerly known as 356F, a classic Helle Comfort staple for years and years. 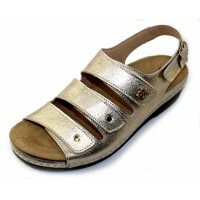 Three band sandal with adjustable velcro closures. Backstrap has an adjustable buckle. Leather linings and removable suede padded cork covered footbed. Rubber sole. Recessed heel cup. 1 1/4 inch heel. Made in Spain. A Word from Martina Helle. In 1987 I started in the shoe business in Germany, which then brought me to America. 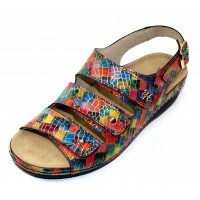 After realizing the need for pretty comfort shoes, Peter and I founded Helle Fashion Comfort in 1997. My vision was to help women with foot problems to be able to wear beautiful and comfortable shoes. Over the years I expanded the collection from flat orthopedic sandals to heels and wedges with the same concept, always using arch and metatarsal supports in the foot beds. Since the beginning I was involved in the design and leather selection for all of our shoes. Only after my approval can the shoes go into production. All of our shoes are “Made in Spain” using Spanish and Italian leathers. I’m committed to creating trendy, fashionable and comfortable shoes, and with our wide range of styles, our shoes appeal to women of all ages. Since 1997 your trusted partner for Feel Good Fashion. Formerly known as 356F, a classic Helle Comfort staple for years and years. Three band sandal with ..